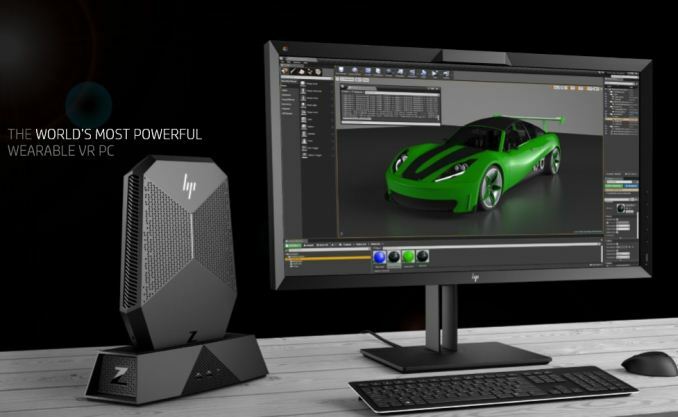 At SIGGRAPH this week, HP has lifted the lid on parts of their Commercial VR strategy, announcing three major aspects of their implementation. In talking with HP, they are confident there is an opportunity in that commercial VR space. The first is to deliver the best and most immersive VR and compute experience. Second is to have an end to end solution. Last is to learn and invest with their partners while keeping an eye on mixed reality. These points, according to HP, translate into optimizing their investment and cut costs for commercial customers. Out of those points come three announcements. The first announcement is the Z VR Backpack. This is a wearable and untethered VR PC, similar to ones we've seen from ZOTAC and MSI, albeit aimed at the commercial space. One use case for such an item can be in training situations, such as military training, first responders. For this type of training, it can be too dangerous or potentially cost prohibitive to do live. Similarly, HP state that in the health care space, training for doctors and nurses can be held in a virtual environment saving time and money, and even help with patient care and pain management. The Z VR Backpack uses an i7-7820HQ and a NVIDIA Quadro P5200 GPU, with a 16GB frame buffer. HP states this is the most powerful wearable VR PC, as well as lightweight and manageable (important to IT administrators). The Z VR Backpack weighs in at just under 10 lbs with both a completely untethered VR solution and a docking ability. Battery life in, “a rich VR experience” (as HP puts it) is about an hour, while less stressful applications can last up to 1.5 hours. As with other mobile VR solutions, HP uses a dual battery system that is hot-swappable to prevent interruption of the VR experience. The docking solution is designed to allow the device to transition back and forth between a content design desktop to a wearable VR PC. Pricing on the Z VR Backpack is $3299 with availability towards the end of September. 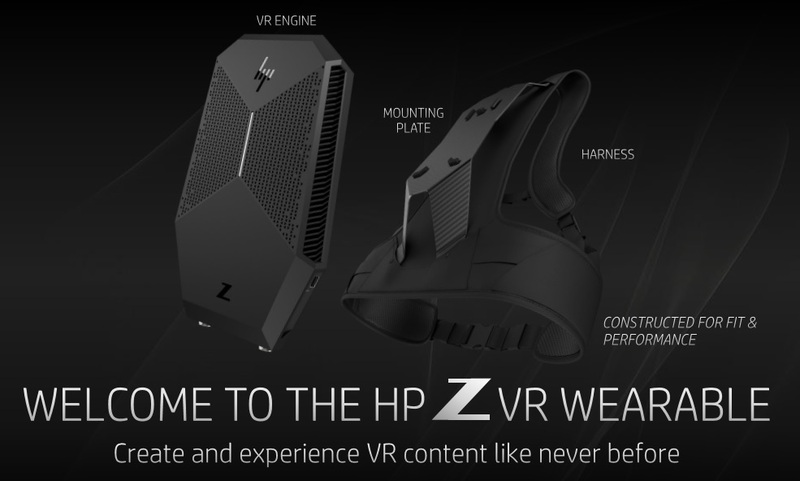 HP brought the Z VR Backpack to SIGGRAPH this year and will be demonstrating military demonstrations, automotive, showroom, and other use cases. 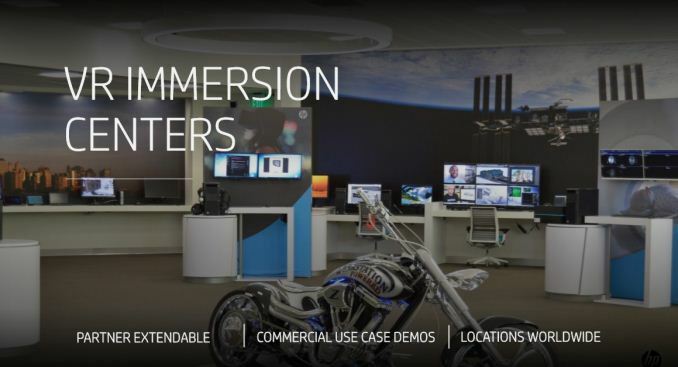 The second announcement, us that HP is creating 'Immersion Centers', places for potential commercial clientele to come in and test the commercial lineup. Part of the reason potential VR clients are apprehensive about getting in the space are partly rooted in a fear, such as how to get started, and so businesses understandably wanted to experience what it can do before a significant investment on piloting a program begins. This announcement is HP's answer to their customers. There will be 13 immersion centers that will have the full HP commercial portfolio on site, from the HTC Vive Business Edition, Z Workstations, mobile workstations and VR commercial desktops, and the Z VR Backpack. They will be located throughout the world with 4 in the Americas, 4 in Asia/Pacific, and 5 in Europe. These 13 sites will all be live by the end of September with the first already starting July 27th. The final announcement is HP partnering with HTC and bringing out the Vive Business Edition. The hardware itself is the same, although the software stack changes with stand alone enterprise software as well as a 1-year commercial license. 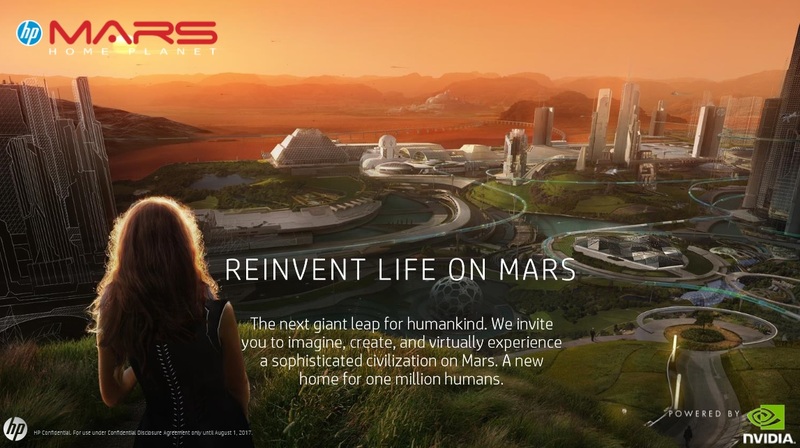 Along with the big push in the commercial space, HP has put out a VR program called HP Mars Home Planet. It is a free to participate environment, where users can collaborate in a VR space to imagine and design a colony on Mars for housing 1 million humans. Members can use Autodesk software to create 3D models of buildings and cities. The world uses terrain from the Mars 2030 game, which uses real map data from NASA research of a potential landing area on Mars. As the program continues, users can download the files and experience what the cooperative effort has developed.